A Hui staffer chants prayers in Arabic as she walks through the main hall of the Golden Palace at the Hui Culture Park outside of Yinchuan, in the autonomous region of Ningxia. In May 2016, the Emirates airline inaugurated its new direct service to the Chinese city of Yinchuan. Yinchuan joins Beijing, Shanghai, and Guangzhou as destinations served by Emirates, meaning that a passenger who boards a plane in Dubai is now able to fly nonstop to China’s first, second, third, or 71st most populous urban area. Yinchuan, situated on the loess-covered floodplain of the Yellow River in the autonomous region of Ningxia, nearly 600 miles west of Beijing and far from China’s booming coastal cities, is a peculiar destination for international tourists. But that remoteness has not deterred Chinese officials from pouring resources into a quixotic plan to turn the city into a “cultural tourism destination” for wealthy Arabs. 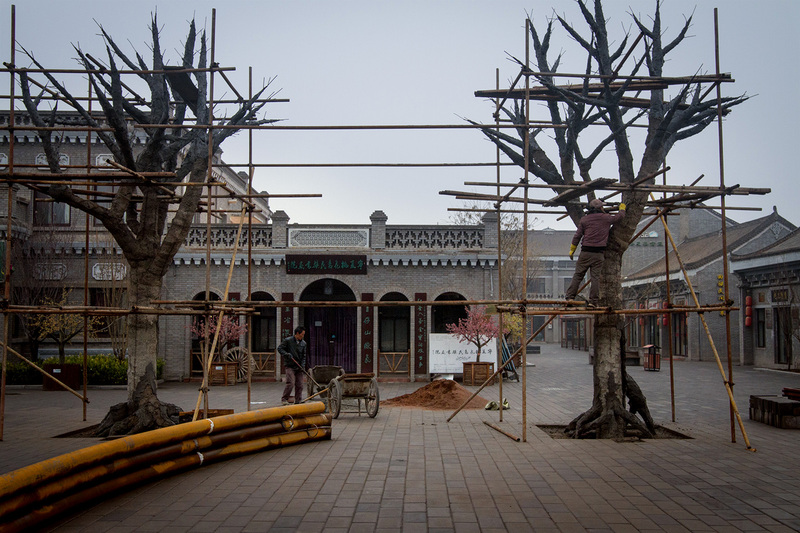 To look the part, Yinchuan is undergoing an ambitious makeover. All of its street signs have been repainted to add Arabic translations and transliterations to the existing Chinese and English. Across from People’s Square in the city center stands an imposing convention center that has hosted the China-Arab States Expo, a biennial event that brings together businessmen from China and the Middle East. South of downtown, a 23 billion-yuan (U.S.$3.6 billion) project to build a “World Muslim City” is slated to be completed in 2020. At Yinchuan Hedong International Airport, construction continues on a nearly 900,000-square-foot terminal to accommodate the anticipated surge in air traffic, including future direct flights from Amman and Kuala Lumpur. The centerpiece of Yinchuan’s transformation is a lavish theme park that celebrates the history and culture of China’s largest Muslim ethnicity, the Hui. According to Ningxia’s tourism bureau, the China Hui Culture Park is a “Sino-Arab cultural bridge” that can “promote all aspects of Sino-Arab exchange and cooperation.” The park achieves a monumental scale, with its sparkling edifices designed to evoke India’s Taj Mahal and Turkey’s Blue Mosque. 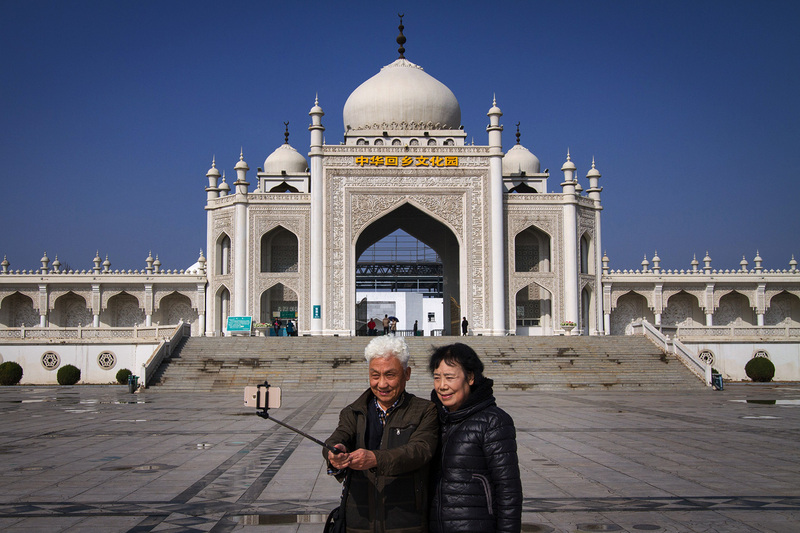 Visitors take a selfie in front of the Taj Mahal-inspired main entrance to the Hui Culture Park. The park’s name is inscribed in yellow over the gates. China’s aggressive “Open Up the West” program of development has seen its fair share of questionable projects. In one notorious misstep, Chinese authorities spent more than $1 billion to construct Kangbashi, a town near Ordos, Inner Mongolia, they once hoped would house a million people; instead, the completed buildings sit empty. Though part of the same national campaign, Yinchuan’s development is unique because of the central role that religion has played in dictating its course. In Yinchuan, schemes to attract Arab tourists epitomize a more profound attempt to articulate, prescribe, and export a vision of Chinese Islam that can be palatable to Beijing and serve its diplomatic purposes abroad. Since 1958, Yinchuan has been the capital of the autonomous region ostensibly governed by members of China’s Hui Muslim minority, a status that has invested the city with cultural significance. The Hui, who traditionally speak Mandarin Chinese, are ethnically and linguistically related to the dominant Han majority. Numbering roughly 10.6 million (or 0.8 percent of the overall Chinese population), they comprise the largest of the ten “nationalities” into which China’s Muslim population is divided. Those figures make the Hui only slightly more numerous than the Uighur (10.1 million), the Turkic-speaking plurality of China’s restive Xinjiang region farther to the west. It is the Uighur who dominate headlines about terrorist conspiracies, government repression, and intercommunal violence. The Hui, by contrast, are generally regarded as more thoroughly assimilated into Chinese society. In the early years of the People’s Republic, the Chinese government had few worries about showing off Xinjiang to visiting dignitaries. In fact, when Egyptian Minister of Pious Endowments Ahmad Hasan al-Baquri became the first Arab official to make a formal visit to Communist China in spring 1955, the Chinese Foreign Ministry arranged for him to attend Eid al-Fitr celebrations marking the end of Ramadan in Xinjiang’s capital of Urumqi. In the 21st century, however, Ningxia has supplanted Xinjiang as Beijing’s approved destination for Muslim visitors, part of a conscious strategy to shift focus from the Uighur to the Hui. 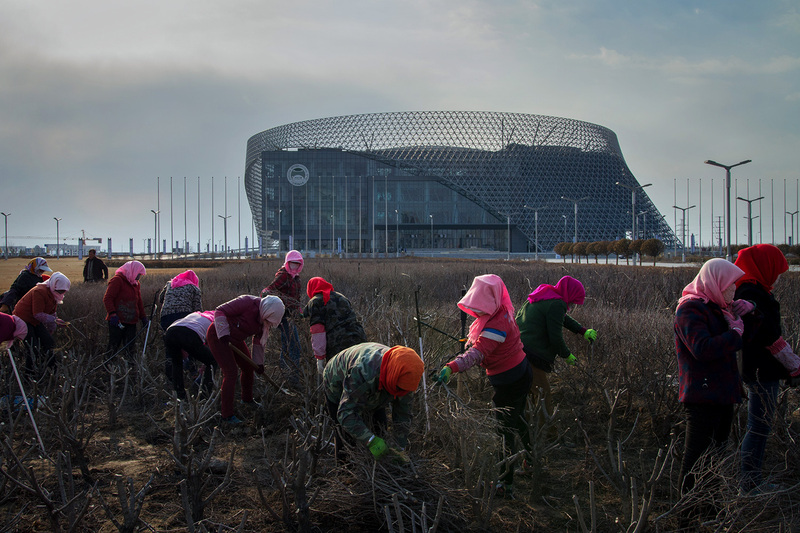 Workers attend to the landscaping in front of Ningxia International Hall, which was completed in 2015 and was the site of the China-Arab States Expo the same year. At a moment in which China’s ties to the Islamic world are fraught with tension, it is easy to see why this shift has occurred. In the past few years, the Chinese government has come under fire for its alleged repression of its Muslims. The nominal leader of the Islamic State, Abu Bakr al-Baghdadi, declared in July 2014 that China is a country where “Muslim rights are forcibly seized.” After the government of Turkey denounced China’s policies in Xinjiang in July 2015, protestors took to the streets of Istanbul, vandalizing local Chinese restaurants and attacking several Chinese tour groups. In December, a media center linked to the Islamic State ramped up its criticism of China and began appealing directly to the Hui as well as the Uighur when it released a nasheed—a type of Islamic chant—in fluent Mandarin calling on Muslims to “wake up” to overcome “a century of slavery.” Together, these developments have demonstrated the concern of some Middle Eastern Muslims for their coreligionists and underscored Beijing’s ongoing interest in promoting an alternative conception of Chinese Islam. That alternative takes material form in Yinchuan’s opulent Hui Culture Park. The fundamental question it poses is whether the Chinese government, by spending money to promote its own vision of Islam in China, will be able to shape a global narrative and earn prestige on the world stage. Currently only mud and sand, plans to develop a Hui culture library and other buildings on this piece of land are part of the second and third phases of park construction. Twelve miles south of Yinchuan along the Beijing-Tibet Expressway, the onion domes of the Hui Culture Park rise abruptly from the dusty plains of Yongning County. The front gate, framed by an intricate façade of plaster molded into Arabic calligraphy, stands an imposing 38 meters in height. Designed to resemble the Taj Mahal, the gate—in the words of regional promotional materials—administers a “visual assault” that can “shake your internal spirit.” Yet while the structure was indeed imposing, on the day I visited the park in August the gate was open only enough to accommodate a single-file line. A handmade cardboard sign above the lone operational ticket window declared that the admission price had been temporarily discounted from 80 yuan (U.S.$12.60) to 60. “Construction,” explained the ticket seller succinctly as I gestured toward it. There is always construction at the Hui Culture Park. Since the park opened to the public in 2005, Ningxia’s authorities have pressed forward with their plan to turn it into a global tourist destination. Behind chain-link fences, work is underway on the second of a three-phase master plan that calls for the completed park to occupy nearly 165 acres. This year, workers also closed down the park’s main museum of Hui artifacts, housed in a building shaped like the Chinese character for “Hui,” for an extensive renovation, even though the original structure is only a decade old. In front of the museum, an army of workers was gathered around the central reflecting pool, which had been drained of its water. They were, I soon learned, installing the infrastructure that would support an elaborate nighttime pageant inspired by Middle Eastern folklore. Titled “A Dream Back into Tales from The Thousand and One Nights” and featuring a laser show with over one hundred cast members, it debuted in September 2015. Taking advantage of the fact that Aladdin, according to legend, was born in China, it invites visitors to see connections between Chinese and Arab culture while enjoying the dazzling spectacle. To create this extravaganza, the Hui Culture Park’s backers spared no expense. They hired a producer of China Central Television’s annual spring gala to oversee the project, engaged a professor from Beijing’s Central Academy of Drama to design the choreography and lighting for the dance routines, and commissioned a celebrated magazine editor to write the script. From the outset, organizers trumpeted their willingness to lavish 200 million yuan (U.S.$31.5 million) on the production. In Chinese publications, the performance is never mentioned without reference to this sum. Anyone who pored over the congratulatory news accounts of its conception and development would be justified in concluding that its de facto title is actually “A 200 Million-Yuan Dream Back into Tales from The Thousand and One Nights.” In the cynical economic logic of modern China, this figure is a powerful piece of propaganda. After all, who could criticize the government’s treatment of a minority population if a venture backed by that same government is willing to spend 200 million yuan on a light-show-and-dance-performance in honor of their cultural heritage? A store inside the Aisha Palace sells souvenir scarves. 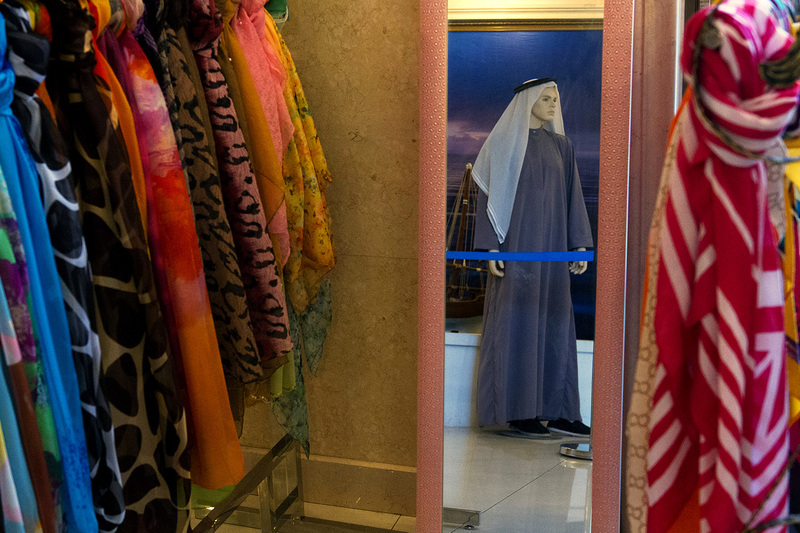 The mirror reflects a mannequin wearing an example of a traditional Arab outfit, often known as a dishdasha or a thawb, that was donated by the Embassy of Kuwait in Beijing. When I visited the Hui Culture Park in August, there was little hint of the elaborate production being installed. With both the main museum and the central reflecting pool out of commission, visitors were shunted down a narrow walkway, past a halal restaurant, and toward a temporary exhibit inside the Aisha Palace, a plain structure that struggles to live up to its grandiose name. Inside, female Hui tour guides took turns explaining their community’s history to clusters of Han tourists. The ethereal effect of the tour guides’ uniforms—floor-length blue and white sequined dresses and blue headdresses with flowing trains to cover their hair—was marred by the conspicuous pink battery packs that powered their microphones. Behind each guide, a gaggle of Han tourists in shorts and sun hats listened half-heartedly to their lectures on the spread of Islam. Unusual for a museum in modern China, the captions on the photographs inside the Aisha Palace were not rendered in English. Aside from plaques in Arabic that proclaimed the general theme of each room in the complex, all the text in the museum was written in Chinese. Two of the four Arabic inscriptions bore scribbles in permanent marker, where misspellings in the original text had been quietly corrected. Since I was, on this day, the only visitor to the Hui Culture Park who was not part of a Chinese-speaking tour group, these blemishes went largely unnoticed. A curator of a museum of the Hui experience is faced with a difficult task. He or she must convey that Chinese Muslims have always been linked to the wider Islamic world, while still demonstrating that their primary loyalties are to the Chinese nation. The exhibits must reinforce that the Hui have always been integrated into Chinese society, while still giving the impression that the Chinese Communist Party has done more to advance their status than did previous regimes. The result is an eclectic and uneven display. The museum celebrates the “enthusiastic participation” of the Hui in Sun Yat-sen’s plans to build a new China and lauds a Hui politician named Liu Geping for his early support of the Communist Party. The exhibit does not, however, include a single mention of the 1960s or 1970s, when the Cultural Revolution disrupted Chinese society and the country’s Muslims faced persecution. Instead, it skips forward two decades to present a photographic collage of Hui officials greeting visiting statesmen from the Middle East in the 1980s and beyond. A Hui tour guide gives visitors an introduction to the “Islamic Civilization to the World” exhibit in the Aisha Palace. After this history lesson, guests at the Hui Culture Park are ushered into a model “village” that purports to replicate the traditional living conditions of the Hui. Its houses double as gift shops, purveying all manner of foodstuffs and trinkets native to Yinchuan. By far the biggest sellers are cheap facsimiles of traditional headwear: knit white skullcaps for boys and flowing sequined veils for girls. While the children of Han tourists frolic through the village wearing their new hats, their parents relax by the concession stand watching folk dancers on a small stage. Glittering in the background behind the dancers is the focal point of the Hui Culture Park, the Golden Palace. The Golden Palace’s onion-shaped domes, flanked by four minarets, are clearly designed to resemble a mosque, but the park’s staff refers to it only as a “palace.” Visitors are required to remove their shoes, and women who desire an immersive Islamic experience can opt to be fitted with a makeshift abaya from a rack by the door. In the corner is a panel explaining how Muslims pray, but one gets the sense that no Muslim has ever actually prayed inside. Instead, the only thing happening during my visit was an animated contest to see which of three tourists could best photograph the tiled dome with a selfie stick. It was a sterile, empty building, and no tourist spent more than a few minutes inside before wandering back into the courtyard. Four bored Hui attendants, all in their early twenties, stood by the entrance taking tickets. Occasionally, one of the girls would rush over to the rack to help an adventurous Han woman into an abaya. Mostly, the four just chatted softly with each other. They were thrilled to see a Westerner—I was the only one that day, they told me—and eager to ply me with questions about who I was and why I was there. When I explained that I was an American who had come to Yinchuan to look around, one of the boys ventured to ask whether I was a Muslim. “I am not,” I answered, and he looked disappointed, so I offered that I could speak Arabic. This revelation was met with considerable excitement. All four of the attendants were able to speak at least a few words. One of the boys was quite adept. Switching to Arabic, he told me that he had spent two years studying in Khartoum. He described the Sudanese capital wistfully, and it was obvious that the opportunity to study in the Middle East had meant a great deal to him. He sighed. “There might be more in September,” he said without conviction. Men share a Quran while sitting on the floor in the main prayer hall of the Najiahu Mosque. Railway staff dressed in traditional Hui-style outfits wait to perform a dance for the passengers in the dining car of a train bound for the autonomous region of Ningxia. A replica of the Saudi Arabia Pavilion, seen in the background, that was built for the Shanghai World Expo 2010, is one of the buildings being constructed in phase two of construction of the Hui Culture Park. The original was designed to resemble an oil tanker. Muslim Hui men gather before afternoon prayer outside the Najiahu Mosque. A receptionist inside the Aisha Palace waits to greet visitors. The palace serves as a temporary museum until construction of the main museum is complete. Inside the main gate of the Hui Culture Park, whose design was inspired by India’s Taj Mahal, wall carvings with Arabic calligraphy mimic traditional Islamic architectural patterns. Construction continues behind the Golden Palace. A map of the ancient Silk Road is part of the “Historic Origin of China’s Hui Ethnicity” exhibition inside the Aisha Palace. A visitor picks out a headscarf to wear before entering the Golden Palace. A pedestrian street in front of a shopping mall in Yinchuan’s city center. A building decorated as a “traditional Hui home” undergoes renovation. It used to serve as a souvenir shop in the Hui Culture Park. Two men leave their shoes at the entrance to the main prayer hall of Najiahu Mosque. He was pinning his hopes on the biennial excitement of the China-Arab States Expo. The event, which grew out of the China and Arab States Economic and Trade Forum first held in 2010, has been staged in its current form in 2013 and 2015. 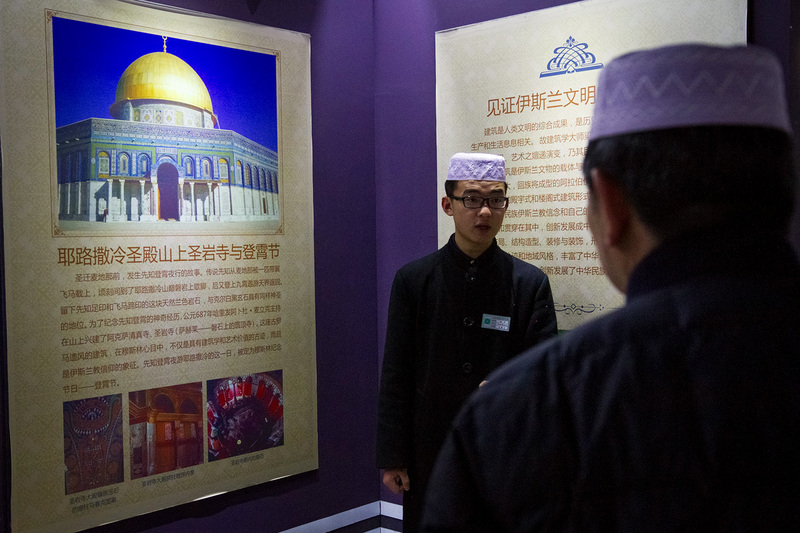 The 2015 iteration was immediately preceded by an assembly of Arabic-speaking tour operators, an indication of the desire of Chinese authorities to use the event to bring Yinchuan into the Islamic world’s consciousness. While the cultural successes of the Expo are difficult to quantify, it is true that the event has produced some potentially lucrative business agreements. China’s Xinhua news agency led off the September 2015 conference with the announcements that Emirates would seek to bring direct flights from Dubai to Yinchuan and that the national airlines of Jordan and Malaysia would work to connect Yinchuan with Amman and Kuala Lumpur. At the same time, the Chinese press announced a plan to set up an exhibit at Dubai’s Hunter International Travel and Tourism travel agency to promote the attractions of Ningxia. So far, Arab visitors have responded to the region’s largest and most expensive tourist draw with only tepid enthusiasm. Only a few journalists have published their reactions to the Hui Culture Park in the Arabic press. While the park has received a smattering of positive reviews—one Algerian visitor, for example, gushed about the “magical splendor” of its architecture—on the whole it is fair to say that the response has fallen short of the frenzy the park’s backers initially desired. 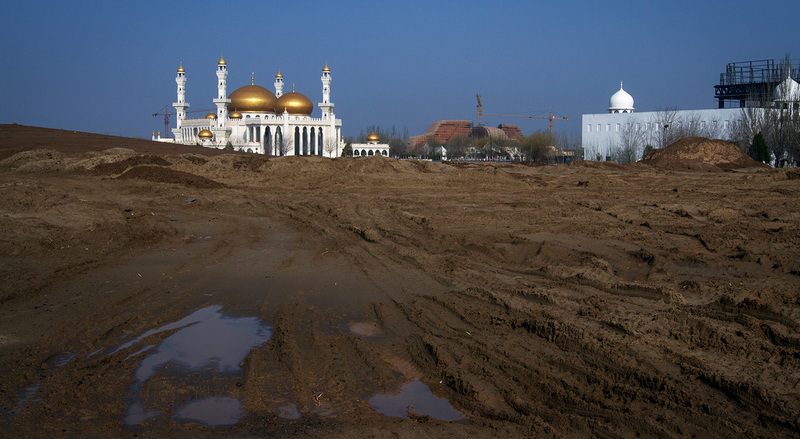 Nevertheless, the park is a valuable component of the larger project to turn Yinchuan into a destination where Muslim visitors can glimpse the state-sanctioned version of Chinese Islam. The park is a fixture of itineraries for official visitors to the city. From journalist junkets to female youth delegations, and from think tank conferences to summits of university presidents, it is becoming increasingly difficult to find any formal gathering of foreign Muslim dignitaries in China that does not, at some point, include a trip to Yinchuan. The report filed by a Qatari journalist in 2014 demonstrates the potency of China’s message. 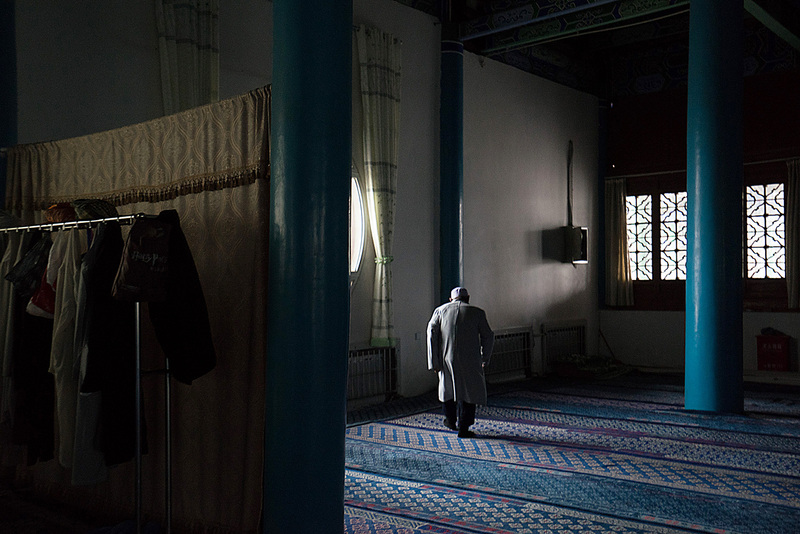 Turned loose by his guides in the neighborhood surrounding the park to interview China’s most politically reliable community of local Muslims, he emerged with a rosy impression of Chinese Islam. After receiving a lecture from the imam of the Najiahu Mosque, just down the road from the park, he made certain to emphasize the “services” that the government provides to the Hui community of Yinchuan. He noted the connections that Chinese Muslims feel to the Middle East: that they study Arabic in mosques, that they take Arabic names, and that many of them go on to do business in the Middle East. By ceaselessly striving to highlight these Sino-Arab cultural linkages, the Chinese government seeks to articulate a vision of its Muslim citizens that is palatable to all. And, thanks to the massive influx of money for development over the past decade, a visiting journalist need not go beyond Yinchuan to discover it. Waiting for prayer to begin inside the Najiahu Mosque. Yinchuan’s pivotal role in China’s Middle East outreach reflects Beijing’s recent efforts to strengthen its cultural ties to the region. Not content to rely on economic relationships with Arab partners, China’s leaders now insist that their diplomacy be underpinned by cultural prestige. A new white paper, released in January 2016 to coincide with Chinese President Xi Jinping’s state visits to Egypt, Saudi Arabia, and Iran, presents an ambitious list of projects intended to raise China’s profile: the establishment of a Chinese university in Jordan, support for Chinese language training in the Middle East, more spots for Arab students to study abroad in China, international art exhibitions, the translation of classic Chinese and Arabic texts, and exchanges of women’s delegations. Collectively, these programs are attempts to address the problem noted in 2007 by former president Hu Jintao that China’s “soft power” lags behind that of its international rivals. The Chinese government’s self-conscious attempts to bolster its international influence have earned criticism from many observers, including the political scientist who first proposed the idea of soft power, Joseph Nye. According to Nye, China’s government, through domestic crackdowns and harsh censorship, actually hinders the country’s production of soft power, which depends first and foremost on the output of independent media. The Middle East, where most residents have little familiarity with China, is an intriguing test case for the limits of state-sponsored influence. The grand experiment behind Xi’s new Middle East campaign is to test whether global cultural cachet can be achieved by government decree. If this goal continues to prove elusive, there may be no more apt metaphor for this initiative’s shortcomings than the glittering minarets of an empty theme park. Exiting back through the main gate of the Hui Culture Park, I trudged across the vast parking lot, desolate except for a few tour buses. Two local children on bicycles sped past the construction wall, not so much as glancing at the colorful advertisements that heralded Ningxia’s other AAAA national tourist sites. A lone taxi driver at the cab stand honked at me to offer a ride back downtown, but I ignored him and kept walking. My ticket promised admission to the “First Hui Street of China,” and I was determined to get my money’s worth. In the recent past, the street housed 179 shops and restaurants offering traditional handicrafts, tourist gifts, and halal meals. For nearly a half mile, visitors could wander a maze of stone buildings and sample everything from pulled noodles to Arabic calligraphy. Today, however, the First Hui Street of China is abandoned. None of the stores is open for business, and only a few have any furniture at all. The colorful carved roofs of the stores are covered by a film of dust, and the paint on the red pillars of the elaborate front gate is beginning to peel. Bricks that have fallen out of the wall of the welcome pavilion lie in piles beneath the open windows, whose panes have been removed. Pedestrians must step over a pile of shattered green glass, cinder blocks, and discarded cigarette butts. Four faded red lanterns from a long-ago festival draw attention to the dangling threads where dozens more once hung. At the far end of the First Hui Street is the courtyard of the ornate Najiahu Mosque, which dates from the Qing Dynasty and can accommodate a thousand worshippers. The Najiahu Mosque was built by members of the extended Na family, who moved to the area from Mongolia. In front of the mosque is a plaque that celebrates the renovation of the mosque in recent decades. The plaque, naturally, ignores the reason why reconstruction was necessary: during the Cultural Revolution, the mosque was shut down and the complex was converted into a ball-bearing factory. While the main prayer hall survived unscathed, other parts of the structure were knocked to the ground. Throughout this period of political upheaval, descendants of the Na family were compelled to raise pigs on the surrounding farmland. Wang Lijuan leads an Arabic Intensive Reading class for second-year students at Ningxia International Language College. Today, the reconstructed mosque does double duty as a functioning house of worship and a tourist attraction. Near the complex’s entrance is a classroom that serves both purposes. During my visit, I stood next to the classroom’s open window to listen to the young boys inside attempt to mimic their teacher’s recitation of Quranic verses as part of an elementary Arabic class, shouting each passage in unison at the top of their lungs. The boys’ passion reflected a frenzy of interest among Chinese Muslims in learning Arabic. According to official estimates, some 3,000 students in Ningxia now study the language, including nearly 1,200 at the massive Tongxin Arabic Language School alone. As construction continues on dozens of projects designed to bring Yinchuan closer to the Arab world, the city’s Arabic mania can only intensify. 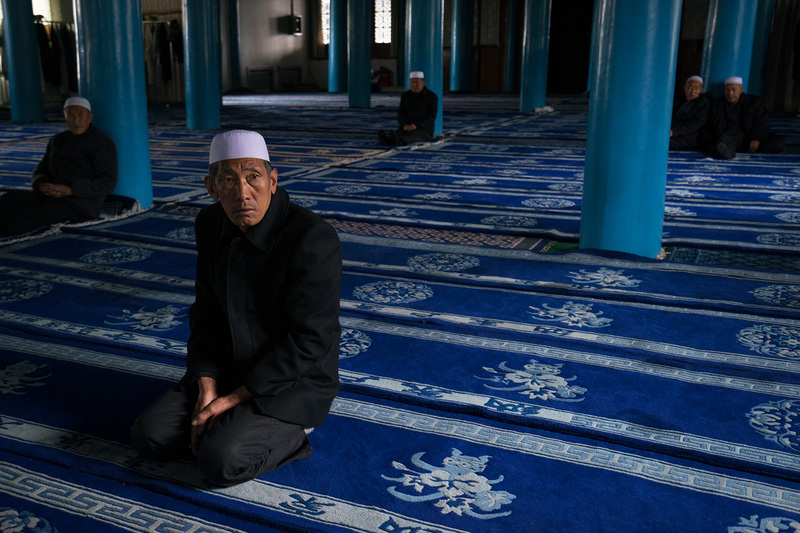 After decades of discouraging religiosity in any form, the Chinese government is now encouraging Muslims to feel kinship with the people of the Middle East. The residents of Yinchuan have embraced their special status with an ardor that extends beyond the control of the state machinery that created it. Chinese authorities may be able to manicure every inch of a theme park to express their chosen narrative, but channeling the enthusiasm of their citizens will prove a far greater challenge. It occurred to me as I listened that the boys in the Najiahu Mosque—reciting Arabic behind open windows at the heart of a tourist site that charges admission—were themselves on display. But at that moment, I did not care whether the scene was staged. Their excitement was the first sign of life I had seen that day. 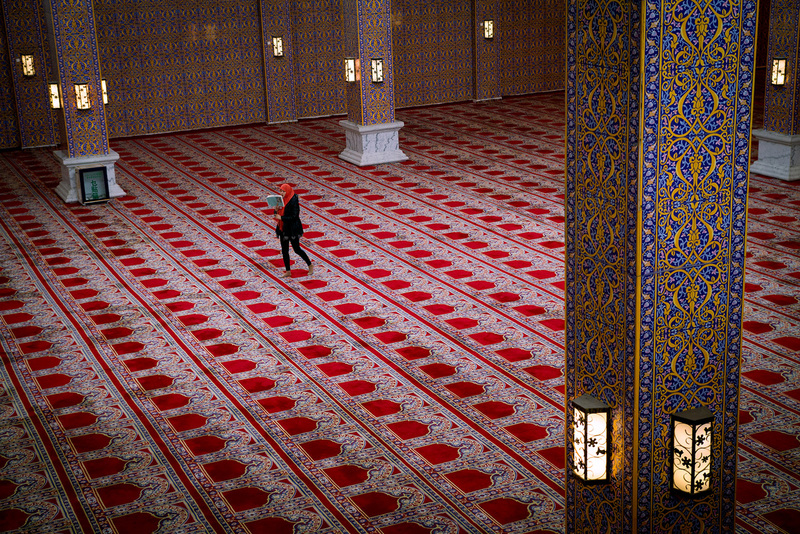 An observant man walks to the corner of the main prayer hall of Najiahu Mosque before mid-day prayer.